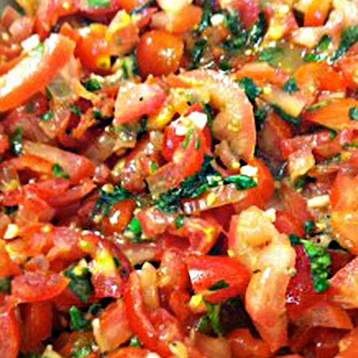 Home » Recipes » Appetizers » Bruschetta Recipe -So Delicious! We have been enjoying bruschetta for the past few weeks for lunch or dinner. It’s so great on a hot summer day and full of flavor the whole family enjoys! We’ve been eating it so much our homegrown supply has finally run out. So today we purchased tomatoes at the grocery store, which were surprisingly fresh and delicious. I recommend purchasing organic tomatoes to avoid fungicides. Chop tomatoes, basil and garlic. Have the kids tear the basil and help mix the ingredients in a bowl. Eat as a side dish, on top of red pepper slices or toasted whole grain bread or a baguette. Comment on Bruschetta Recipe -So Delicious!